The Norway trip can be divided into two parts: the solo portion, and the portion after my friend Jake arrived. This post begins on a Saturday morning, and Jake was not scheduled to arrive until Thursday. I had some time on my own, which worked out pretty well. Jake and I have different methods of photography and travel, methods which have diverged a bit over the past few years. I've slowed down: I like to pick out sunrise and sunset spots in advance, thoroughly scout out areas, and spend an hour or two at a time at a particular spot. Jake is a little more spontaneous (and this spontaneity can pay off with very good pictures, as will be seen later in this travelogue series). 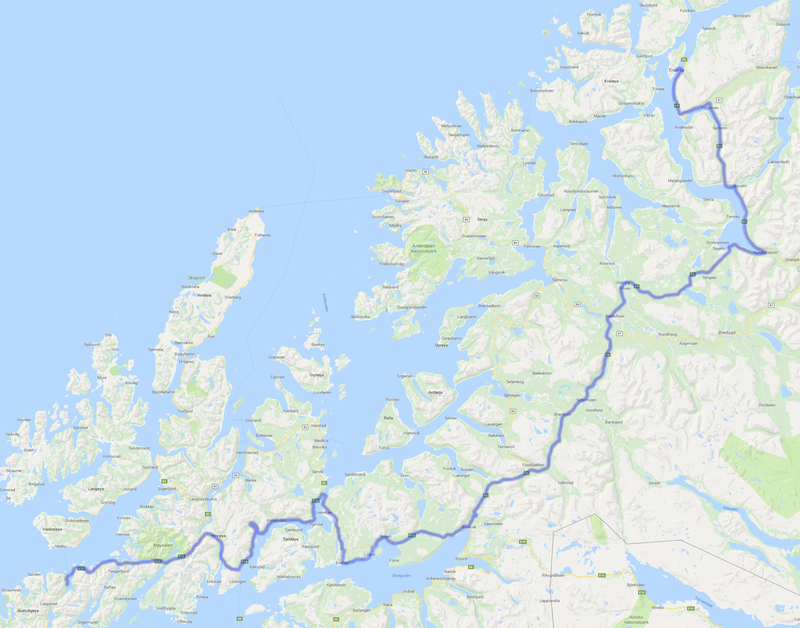 Because of our different styles, I elected to plan my trip around the part of northern Norway that was best-suited for my method of taking pictures: The Lofoten Islands. Part 2 (and likely part 3) will focus on this area, but first I had to get there. This landscape photography hot-spot was over 300 miles from where I woke up on Saturday. This day started relatively late, as I needed to sleep off the jetlag and the aurora chase from the night before. By the time I left Tromsø, it was almost 10. An earlier start would have meant an extra sunset in the popular area, but I really needed that time to recharge. It also let me drive the unfamiliar stick-shift car out of town at a less busy hour. The first part of the drive was along the fjords towards the main truck route in this part of Norway, the E6. This gave me my first real look at the landscape on this side of the Arctic Circle. The road leading away from Tromsø has lots of pullouts, which created nice landscape opportunities, including this attempt at black and white (I'm not sure why my conversion is banding here, that mystery will have to be solved at another time). At this particular stop, a trucker approached me and asked for a jump start. As a reward for helping, he gave me a can of very bad beer. Jake and I would share that beer over a week later, a reward for surviving the most harrowing drive of the journey. The road from Tromsø meets E6 in the town of Nordkjosbotn, located at the base of a long fjord. Not all of the fjords were frozen - temperatures are pretty moderate near the ocean - but this one was pretty photogenic. This day was filled with a lot of hazy light, which worked pretty well when used in the proper way. This being northern Norway, people seemed to be enjoying themselves way out on the ice. If you can't enjoy days like this, you shouldn't live in the arctic. After the major junction in Nordkjosbotn, the path turned inland through a series of valleys. Henning, the man who runs the rental van company, warned me about this stretch, as the cold is notorious for killing his batteries. This area of Norway went through one of the worst cold snaps in recent memory in the weeks leading up to the trip, but thankfully things were beginning to moderate by the time I arrived. The coldest I experienced on the first day was about 15 degrees F, with highs near freezing. I really botched the exposure in the photo below, but it shows that there are landscape opportunities in Norway beyond the typical grand scenes of big mountains behind frozen water. Every road trip needs road shots. This is looking back towards where I came, mostly making fun of myself for covering the equivalent of 100 miles in five hours. Too many photo opportunities! The next photo is definitely the one which made me drive most like an idiot that day. Once I saw the blue ice under a side road overpass, I knew I had to get a picture here. Unfortunately I spotted the location after I had already driven past it, and in trying to execute a three-point turn on a relatively busy road in the middle of an army base, of course I had a poorly-timed stall. This stick shift inexperience wasn't really a huge deal on the highway this day, but I definitely had trouble whenever I had to do something under stress. Up in the hills came the first look at the little red houses of Norway. They are incredibly photogenic and they are everywhere. Need to scale a scene? There's probably a red house for you. The haze was a little heavy at this point, but it's hard to try to avoid taking pictures of all of the little buildings. After a few hours of constant speed cameras and tanks, we finally arrived back at the coast just in time for the sun to begin to set. But first, some more mountains behind ice. There will be a lot of pictures of mountains behind ice. And now for the sunset itself. I generally hate shooting directly into the sun. I tend to look for what the light is hitting or the aftermath in the sky instead. However, this distant view across the ocean with the sun kissing the peaks was too good to pass up, even if I had to try to perch myself on top of a snowbank to move the foreground trees into a better position. I also have no idea how to process skies that are saturated to begin with, so this one was barely touched. Better under-saturated than over, I guess. Sunrises and sunsets in the arctic last forever. It's one of the best parts about photography there, unless the sunset is boring and you have to wait three hours for it to be dark enough for aurora to show up. On this day, the sunset wasn't boring, and the long-lasting sunset was extremely useful. After taking the photo above I really wanted a vantage-point by the water, which meant turning off the main highway and driving through some ocean-side towns. However, it took over half an hour to find a public beach of any sort, and the one I found was basically the back lot of a gas station. I really struggled to find a great composition; ideally I'd be panned further left but I didn't really feel like including some business' loading dock in a landscape photo. These were the best I could do. They're not bad considering the circumstances but I wish I had more time to prepare. After sunset, it was time to cover some ground. Between the late start and frequent stops along the way, I was way behind schedule. The goal was to get to Svolvær that night, the first major city on the Lofoten Island chain. During the multi-hour arctic dusk, I didn't stop much. This photo was taken at the final stop of the day, near the tiny town of Laupstad in a plowed picnic area. Technically this is the first picture in this series from Lofoten, though it's still pretty far from the main tourist areas. There was also better foreground right around the corner, but I didn't find it until the next morning. Look for more pictures from this general area in the next photo set. The only problem is that these long aurora exposures start to show some of the flaws with my camera's sensor, so this isn't something I can ever print. The web size works, though! This is going to be a common theme throughout the trip, but the next few days of photos will feature no aurora. With the mission of day one accomplished, it was time to spend 20 minutes figuring out how to turn on the van's parking heater and get some sleep. Some very long, very rewarding photography days were still ahead.